If you’re looking for a simple way to track your activity levels and reach a fitness or weight-loss goal, we’ve produced some pedometer reviews for uk deals to see whats on offer. It’s not always easy to find the motivation needed to get up and exercise, but a pedometer can give you measurable progress that helps to push you towards your goals. An increasing number of doctors and fitness experts recommend walking 10,000 steps every day as part of a health lifestyle. Pedometers all tend to work in the same way, recording each of your steps using internal sensors that pick up your movement, and multiplying those by your stride or step length. Most devices will allow you to input your stride length manually, which means your pedometer will give your really accurate measurements of the distance you have walked over the course of the day. There are a few ways to measure your stride length. One quick and simple way is to place a marker such as a pebble, chalk mark, etc. behind your right heel, then walk 10 steps and mark the spot where your right heel finishes. Measure the distance and divide that by 10. 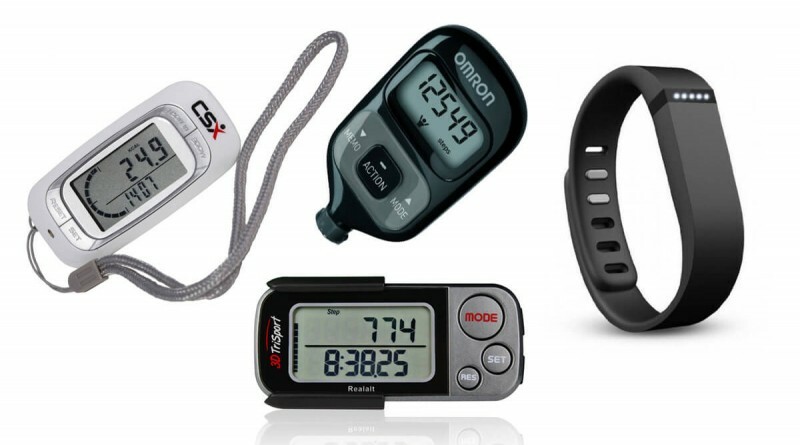 With a range of options for all budgets, these devices can be a great low cost alternative to more expensive GPS units, so let’s take a look at the pick of the current bunch, with our collection of pedometer reviews. One of the most popular pedometers available right now is the [amazon text link id=”B0045EPE8A” text=”Omron Walking Style III Pedometer”]. This is a small, discreet device that’s really easy to use – just input your height and stride length and you’re ready to go. It allows you to instantly view your daily step count, and therefore indicates how much exercise you are getting each day. The number of steps you’ve taken is converted into total distanced traveled in kilometers or miles. The Walking Style III also tells you how many calories you have burned off each day, giving you a push to walk a bit further and burn off more calories (or reach for an extra guilt free biscuit). 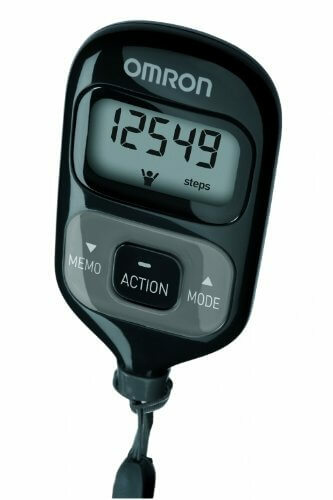 The Omron Walking Style III has an ‘Action Mode’,which is useful when you want to measure a specific period of exercise, e.g. if you are going on a hillwalk or you want to know how far you walk to work in the morning. Action mode is simple to use, and is activated by pushing the center button, then stopping when you press it again. The 7 day memory means you can review your weekly activity and calculate how many steps you have achieved over the course of each week, and the Omron Walking Style III comes with a useful lanyard and clip so that you can attach it in various ways and places. You can also carry it in your pocket, clipped inside your bag or attached anywhere else on your person and will still accurately detect your steps. The CSX Walking 3D Pedometer Fitness Calorie Monitor will accurately track your activity throughout the day and help you achieve your fitness goals. The CSX features tri-axis silent walk sensor technology, so it will accurately track your activity regardless of how you attach it to yourself. You can clip to your clothing or store it in a pocket, bag or purse. For increased accuracy, the built in “Walk Sensor technology” avoids counting sudden movements as steps. To achieve this, the counter will not count any movement less than 10 consecutive steps. The CSX will track a number of measurements including the daily steps taken, calories burned and distance walked in miles or kilometres. Your activity time displays your daily movement time while walking and features a 7 day memory. The pedometer also automatically resets at midnight so you can easily track your daily steps, distance and activity. You can set your daily target for number of steps, and the CSX displays a progress bar for easy viewing, alerting you with an LED and beep indicator when you’ve reached your daily target. 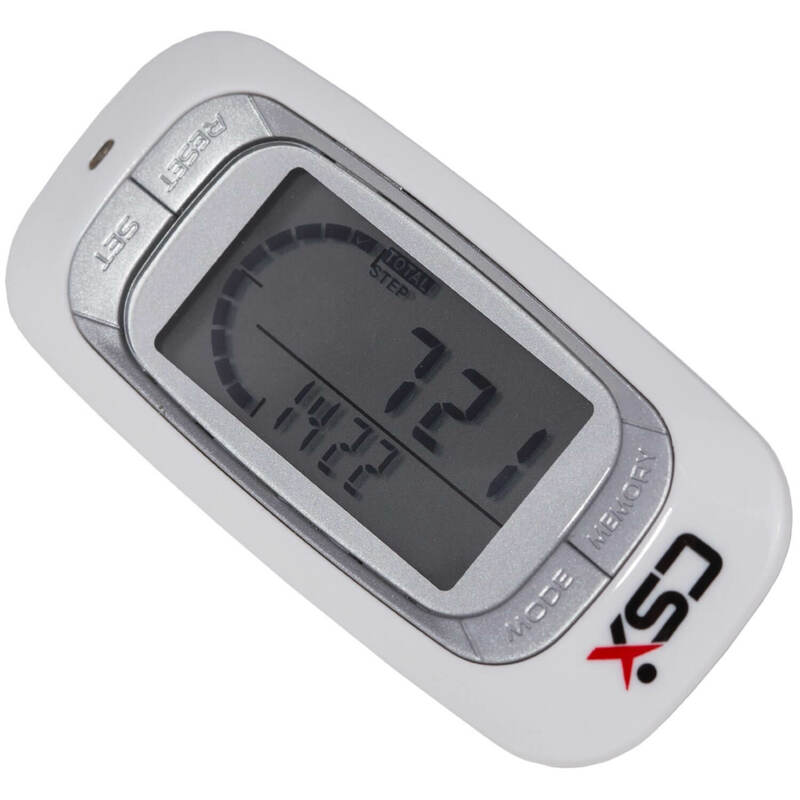 The 3D TriSport Digital Pedometer features a Tri-Axis accelerometer which accurately measures steps whether positioned flat, vertically or horizontally and regardless of how it’s worn or carried. The device is small and lightweight, and records Daily Steps (Walking & Running), Distance (miles or Kilometers), Calories, Fat Burned and time spent exercising. All of this data is displayed on an easy to read screen. The lithium 3V CR2032 battery should last approximately 6-12 months depending on usage and is easy to change. Records Daily Steps (Walking & Running), Distance (KM & Miles), Calories, Fat Burned and Excercise Time. Highly Accurate. Works Vertically or Horizontally. 30-DAY MEMORY: 3D Trisport will Store up to 30 days of information, you can track your progress to help keep you on Track & Motivated. 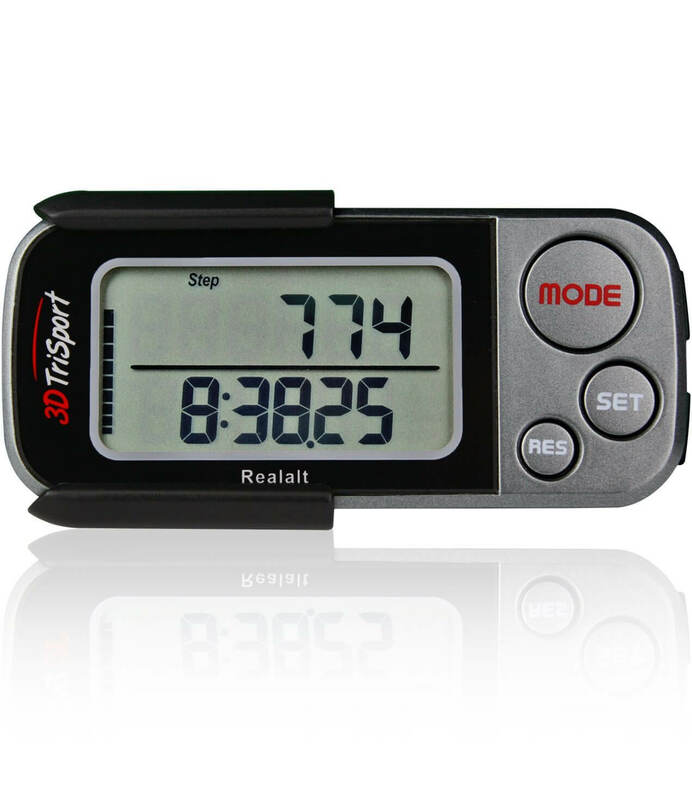 Overall the 3DTriSport Pedometer is easy to use, very accurate, has a large display and is easy to setup, so its a great choice. The Fitbit Flex tracks a range of data including your steps, distance covered and calories burned, and shows you progress made against your daily goals using the display to highlight each segment of progress. It also tracks your sleep and includes a silent alarm for waking in the morning without disturbing others. All of this data can be viewed and analysed easily using your PC or the smartphone/tablet app for iOS or Android. There is also an online community where you can compare your stats with others and take up challenges, etc. 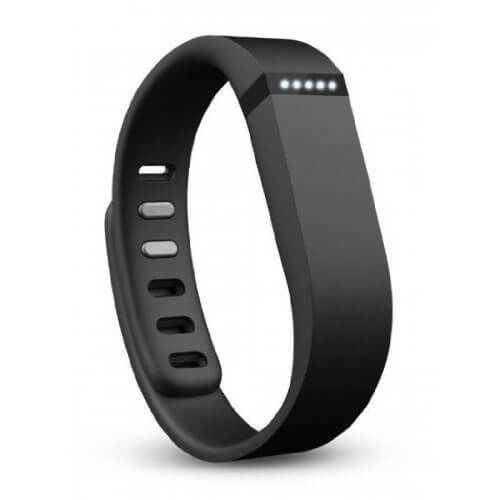 The Fitbit Flex is also water resistant and can be worn while showering etc. In terms of comfort, the flex doesn’t need to be worn too tight to give accurate measurements, so it can be worn loosely and still track your activity. The flex is designed to distinguish between movements such as driving or typing, and actual steps, and filters out motion that isn’t stepping. The results are quite impressive. Battery life per charge is good, with the flex taking around 3 hours to charge and lasting for around a week between charges. If you’re using the iPhone Fitbit app, there are some nice features that can really help your exercise and motivation. For example, you can set up spoken cues for distance, time, average pace, split pace, or calories burned. The frequency of these cues can be tailored as can the audio volume. Then when listening to a playlist on your iPhone’s you’ll get audio cues as you exercise. If you activate location services for Fitbit in your phone settings you can also use your phone’s GPS and map to display your location. As you walk, you’ll see a screen showing how far you’ve walked, rate per mile, time elapsed. 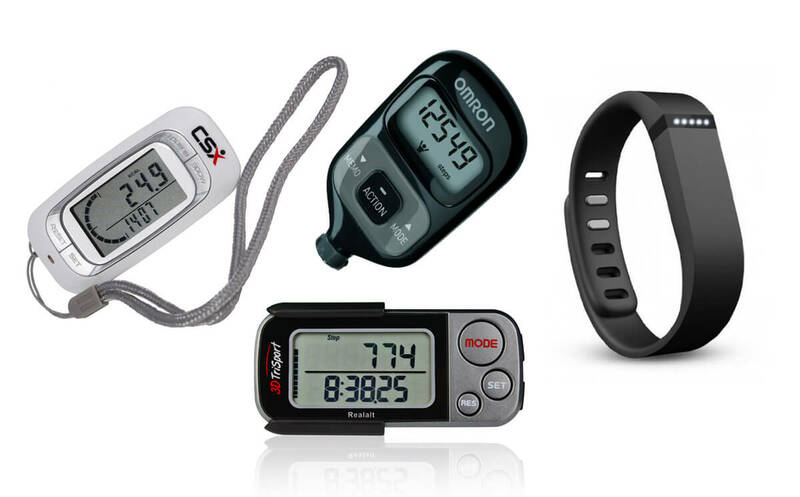 All of the pedometers shown here are highly accurate, lightweight, and can help your fitness motivation and progress. So there you have it, why not check out one of these great little devices if you’re looking for the best pedometer UK deals available now. We hope these quick pedometer reviews uk were useful – feel free to comment below!